ABOVE: An old 70-Pfennig postage stamp. 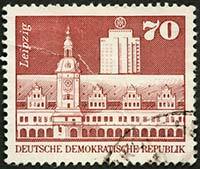 The engraving shows Leipzig's Old City hall and a Hochhaus or skyscraper from the GDR era. A restaurant in a 19th Century "trade show courtyard"
Photo copyright © Ray Roper.